CHRIST IS RISEN FROM THE DEAD TRAMPLING DOWN DEATH-BY-DEATH GRANTING LIFE TO THOSE IN THE TOMBS! 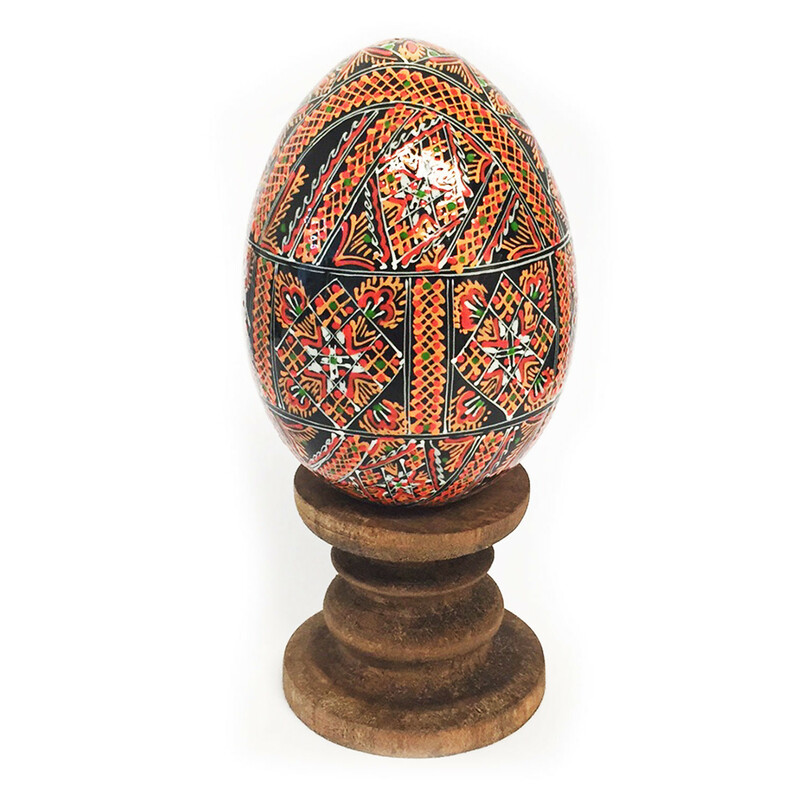 These colorful wood eggs have been hand painted in the Ukraine with traditional folk and religious symbols and designs. The egg is an ancient symbol of new life and rebirth spanning many religions and cultures. To the ancients the egg embodied great power to bring new life and joy. The Ukrainian people in pagan times decorated eggs to commemorate their Slavic gods and to celebrate the sun’s arrival at the coming of spring. The Christian Church adopted the egg as a symbol of Christ’s Resurrection. St. Augustine first described Christ’s Resurrection from the dead as a chick bursting from an egg. This symbolism was enhanced in the Christian East’s celebration of Pascha (Easter). At the end of the Pascha Liturgy, the faithful exchange three kisses on alternating cheeks with the greeting “Christ is Risen” to which is replied “Indeed He Is Risen.” The priest presents each with a “red” egg. At home a variety of egg dishes were prepared in different ways were served during the Easter celebration. Egg cracking games were played revealing the future until next Pascha. Egg shaped deserts were elaborately prepared. Wood eggs were suspended from hanging lamps and chandeliers. Often wood eggs would be decorated with icons and hung from the home’s vigil lights. The Ukrainian people enhanced their pre-Christian folk tradition of decorating eggs to include Christian symbolism such as the Cross. Painstakingly each egg was hand decorated with natural dyes. There are several folk traditions associated with the Blessed Virgin Mary with Pascha eggs. One tradition is Mary standing at the foot of the Cross collected Christ’s blood, which turned, into “red” eggs. Mary cried and as her tears fell on these eggs beautiful designs appeared on them. Another tradition is Mary carried these eggs in her apron to plead before Pontius Pilate for Christ’s life. On her way she gave the eggs to people as an expression of our Resurrection from dead redeemed by Christ’s blood. Falling on her knees before Pontius Pilate the eggs rolled from her apron all over the surface of the world giving hope of Christ’s Resurrection. Ukrainian folklore is the “world will end” when they stop making Pysanky!